This project is basically an RC car that you can control over a local network or the Internet. Real time video and audio feeds are available to the operator and observers of the car. Unlike many other solutions for allowing this kind of communication and interactivity; this platform provides a seamless experience for clients because it requires no installation or configuration. This solution can be controlled from any platform that supports the Adobe Flash Player. The key to making the car controllable by a computer is the RC Interceptor. It can be easily inserted into an existing RC electrical system in a matter of minutes. You just place the RC Interceptor between the radio and components you wish to control such as a servo and electronic speed controller(ESC). Another great feature about the RC Interceptor is that it can be left in the RC electrical system so there is no need to remove it between uses. When the USB cable is plugged in, control is provided by the computer. When the USB cable is unplugged, the RC Interceptor will allow signals to travel from the radio unaltered to the ESC and servo. There are two components to the software of this project. The Flash application and the server application doing the heavy lifting in the background. I created the flash application using Flex. It can be configured in a server mode as well as a client mode. The client view provides many more controls and feedback mechanisms. The server mode simply shows the video streams as well as information about connections. In the background, the open source Red5 media server is providing facilities for video and audio streaming. 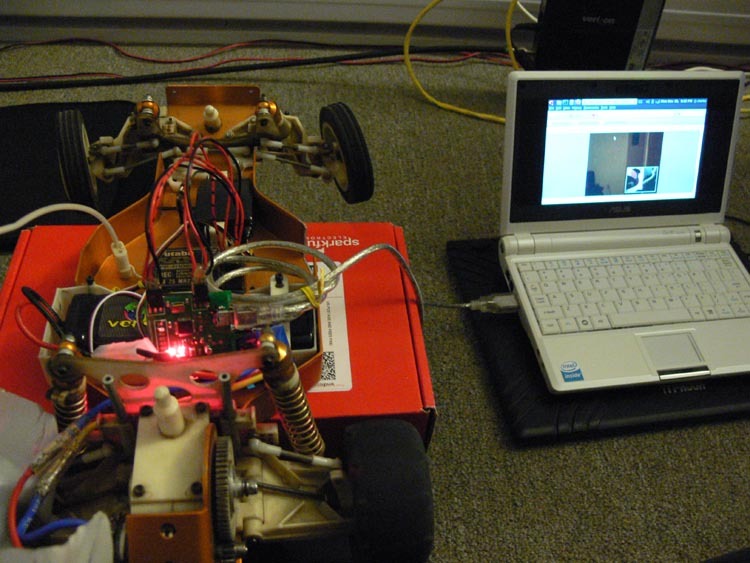 Additional functionality within Red5 is provided by a series of software mechanisms in Java that I have implemented or authored including serial communication, wireless signal polling on Windows(using Placelab) and Linux(custom written), as well as methods for controlling the RC Car.